Google has released its first diversity report since the infamous James Damore memo and the fallout that resulted from it. Those are both long stories but the TL;DR is that Damore said some sexist things in a memo that went viral. He got fired and then sued Google for firing him. That lawsuit, however, was shot down by the National Labor Relations Board in February. Then, it turned out another employee, Tim Chevalier, alleges he was fired for advocating for diversity, as reported by Gizmodo later that month. Now, Chevalier is suing Google. In court, Google is trying to move the case into arbitration. Earlier this month, Google’s attorney said Chevalier previously “agreed in writing to arbitrate the claims asserted” in his original complaint, according to court documents filed June 11, 2018. 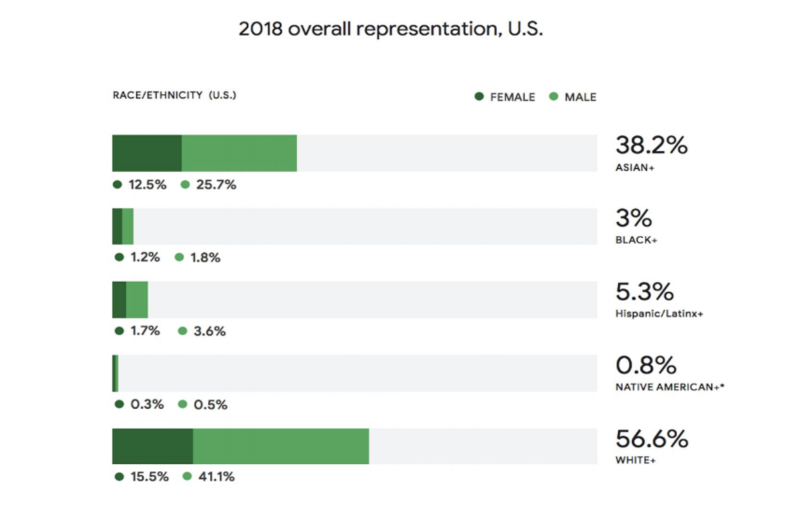 Now that I’ve briefly laid out the state of diversity and inclusion at Google, here’s the actual report, which is Google’s fifth diversity report to date and by far the most comprehensive. For the first time, Google has provided information around employee retention and intersectionality. Google also recognizes its gender reporting is “not inclusive of our non-binary population” and is looking for the best way to measure gender moving forward. 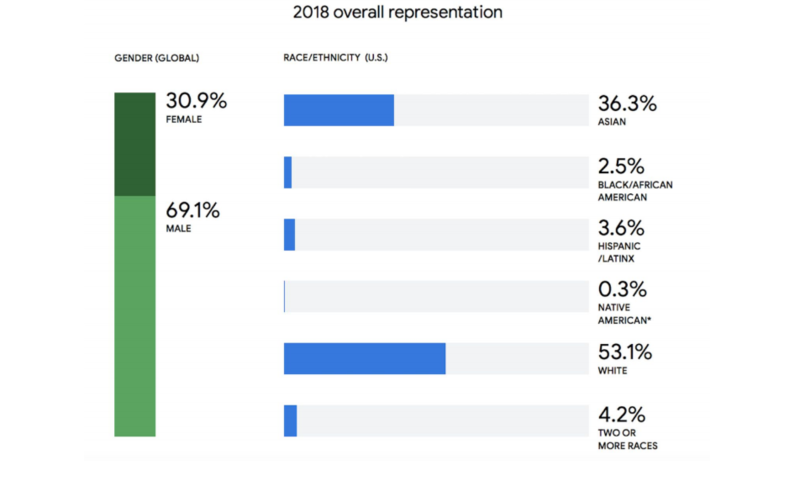 As Google itself notes, representation for women, black and Latinx people has barely increased. Last year, Google was 30.8 percent female, 2.4 percent black and 3.5 percent Latinx. At the leadership level, Google has made some progress year over year, but the company’s higher ranks are still 74.5 percent male and 66.9 percent white. So, congrats on the progress but please do better next time because this is not good enough. You know as well as we do that it’s a long game. Do we ever get to good? I don’t know. I’m optimistic we’ll continue to make progress. It’s not a challenge we’ll solve over night. It’s quite systemic. Despite doing it for a long time, my team and I remain really optimistic that this is possible. As noted above, Google has also provided data around attrition for the first time. It’s no surprise — to me, at least — that attrition rates for black and Latinx employees were the highest in 2017. To be clear, attrition rates are an indicator of how many people leave a company. When one works at a company that has so few black and brown people in leadership positions, and at the company as a whole, the unfortunate opportunity to be the unwelcome recipient of othering, micro-aggressions, discrimination and so forth are plentiful. She added that some of Google’s internal survey data shows employees are more likely to leave when they report feeling like they’re not included. That’s why Google is doing some work around ally training and “what it means to be a good ally,” Brown told me. “One thing we’ve all learned is that if you stop with unconscious bias training and don’t get to conscious action, you’re not going to get the type of action you need,” she said. via Google: Attrition figures have been weighted to account for seniority differences across demographic groups to ensure a consistent baseline for comparison. As noted above, Google for the first time broke out information around intersectionality. According to the company’s data, women of all races are less represented than men of the same race. That’s, again, not surprising. While Google is 3 percent black, just 1.2 percent of its black population is female. And Latinx women make up just 1.7 percent of Google’s 5.3 percent Latinx employee base. That means, as Google notes, the company’s gains in representation of women has “largely been driven by” white and Asian women.